Wow. 2011 has gone by in a flash. I can’t believe the year is almost over! Don’t we say that cliche crap every year? Yes? Well it’s true. Ok, so Christmas is here. It’s my favorite time of the year, for realz. As a kid, my mom would totally Christmafy the house. She has some really cool old decorations. The holidays are really special when you walk into the living room and you see that Christmas has puked over everything. 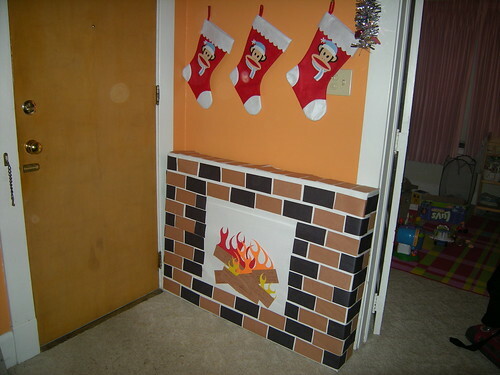 I was missing two things, a vintage cardboard fireplace and a wall decoration to hold Christmas cards. Brian decided that we needed a fireplace, and I made us a card wreath. And here is my wreath!!! This was super easy. And surprisingly enough, it’s not from Pinterest! It’s kinda my own creation! I am also proud to tell you that every item used in this craft was something I just had on hand. I didn’t have to run to the store for anything! With your cardboard, make a giant circle. To get an even circle, tie a piece of string to a pen/pencil. Hold the string in the middle of the cardboard, and trace a circle holding down the string. Then make a smaller circle inside the big circle. If you can wing it, just eye it. Cut out the wreath with scissors or the knife. If necessary, use multiple pieces of cardboard and duct tape them together once cut out. Lay the t-shirt on a flat surface. Cut off the hem and discard it. Cut strips about 2-4 inches thick, starting from the bottom of the shirt, towards the top. It doesn’t really matter how big the strips are, they will overlap. So if you cut them all wonky, it’s all good. Once cut off the t-shirt, cut each strip on one side, so it is no longer connected and just one long piece of tshirt. One at a time, wrap the t-shirt strips around the cardboard. 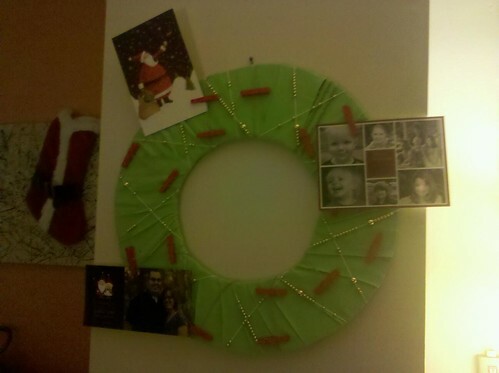 Pin them to the board or something, but don’t glue them until you get all of the strips on the wreath. Make sure all loose ends are on the back of the wreath. If you need to paint the close pins, do that now, or earlier. Paint all sides. String the beads on to the hemp or embroidery floss. Or both! My beads wouldn’t fit on the hemp, so I strung them on white floss. Tie one end of floss to the wreath, leave some of the beads on the front of the wreath, and the knot on the back. Wrap the floss tight enough around the wreath that the beads wont be able to slide to the back. When complete, tie the floss again. Now, you can either string the close pins on another piece of string, or just glue them to the wreath, your choice. I chose to string mine. Again, pull the string tight enough that the close pins don’t slide to the back. A small tip: have the close pins point in different directions so you have some options for your cards. Leave a little slack in the close pin string so that you can glue each of the pins to the fabric. Take your time with gluing – we all love hot glue, but no one wants to see it! Once everything is tied on/wrapped around the wreath, it’s time to get your glue on. I put small dabs under every layer of fabric, as well as adhering all knots to the wreath. Once everything was secure, I took an extra strip of fabric and glued it to the back of the wreath, in a circle, to cover some of the back of the wreath. Then hang your wreath and wait for the mailman to deliver your cards! The holidays are upon us – it’s time to stock up on flour, sugar, eggs, butter, vanilla, the list goes on. 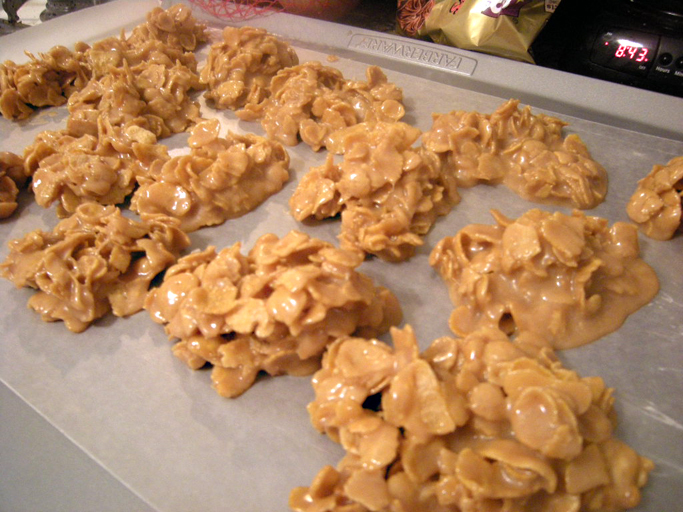 I’ve been getting a head start on holiday baking – I’ve made three batches of Chex Mix and some Becky Droppings (details below). No slacking here! I’m in the middle of sewing some dresses and making Christmas presents for the nieces, nephews and neighbors, AND working on an awesome vintage Advent calendar. My mom has been crafting for years; back in the 70’s she bought and made a kit from Lee Wards for an advent calendar for a wall. The project as a whole is about 90% felt and 10% sequins and beads – that is some math I can handle. Since the calendar is made from a kit we don’t have a pattern. So I put my graphic design skills to work and made a pattern – I’ll try to post some photos in the weeks to come. The parents haven’t decorated for Christmas yet, so I haven’t been able to snap a photo of what my final product should duplicate. You may notice some disdain in my tone that my parent’s haven’t decorated for Christmas yet 🙂 Please know that my tree is up and the lights are on – it is beautiful. This is my first year with my own tree, so I will be borrowing some decor from my mom. But I don’t remember the last time she put the good HOMEMADE ornaments on the tree, so it’s not like I’m borrowing decorations she normally puts up! These are Becky Droppings. You probably have another name for them, but that is the Ray Family traditional name. This is a no-fail recipe – even if you don’t follow the recipe (which I rarely do), they will turn out fine. Also, you cannot stop at one. See that pan above? Those were made two hours ago. There is one left. Good luck. Bring sugar, syrup and vanilla to a boil. Boil/heat until sugar is dissolved. Turn off heat and add peanut butter, mix until smooth. Add cereal. Stir, evenly distribute cereal and coating. Spoon into droppings on waxed paper. Eat.